Mumbai: The rupee hit yet another record low on Wednesday as worse-than-expected inflation data and the US Fed’s decision to hold back on new stimulus steps heightened fears that capital outflows from emerging economies such as India could accelerate. "We have to prepare ourselves for possibly new lows on the rupee every day," said Naveen Raghuvanshi, associate vice-president of currency trading at the Development Credit Bank. "You name a negative and it is there for the rupee," he said. "We could see 56 by end of this month." While some traders said the Reserve Bank of India (RBI) may step into the market, any intervention would likely have little long term impact given India’s relatively limited foreign exchange reserves and the host of negative factors lining up against the currency. The country’s wholesale prices rose 9.11% in November, leaving inflation stubbornly high and suggesting the RBI would hold rates steady at its review on Friday even as worries grow over the health of the economy. C. Rangarajan, chairman of the Prime Minister’s Economic Advisory Council, said India could do little to check the fall in the rupee, which is also being buffeted by external factors. The euro slipped versus the dollar on Wednesday after Italy paid a euro-era record yield of 6.47% to sell five-year debt, adding to concerns that an EU summit last week had made little progress in tackling the region’s debt crisis. Sailesh K. Jha, head of Asia strategy at Skandinaviska Enskilda Banken, said the rupee was vulnerable because of large external debt payments of about $20 billion due in the first half of 2012 and because importers were not effectively hedged. "We anticipate continued net outflows from the equity market into first half of 2012 as the uncertainty on the outlook for India growth, inflation and macroeconomic policies lingers," Singapore-based Jha said. 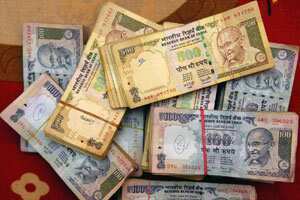 The rupee, Asia’s worst performing currency this year, could slip to 55 to the dollar by the end of December and head to 57 in the first quarter of 2012, he said. However, the currency will probably rise modestly by the end of next year, a Reuters poll showed. At Wednesday’s close the rupee is down about 18.3% from its 2011 high in July. One-month offshore non-deliverable forward contracts were quoted at 54.17, indicating a short-term negative outlook for the onshore spot rate. The one-month onshore forward dollar premium was at 34.25 points, up from 33 on Tuesday. In the currency futures market, the most-traded near-month dollar-rupee contracts on the National Stock Exchange, the MCX-SX, and the United Stock Exchange were about 53.92 above the spot rate. The main stock index closed down 0.76% after a choppy session as the higher-than-expected inflation figure dampened hopes of any immediate monetary policy easing. While the RBI is widely expected to keep rates on hold at its review on Friday, economists expect it to accelerate monetary easing in 2012 as economic conditions worsen in Asia’s third-largest economy.